Born in 1949 at Hekinan-shi, Aichi Prefecture, Japan. Graduated from Toho University, Faculty of Medicine in 1974. Studied Digestive Surgery and General Surgery at Toho University Hospital. 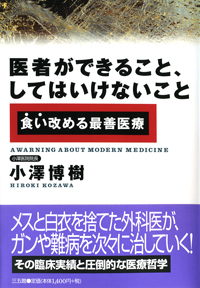 After opening his clinic, he started to doubt contemporary medicine and devoted himself to Oriental thought and Oriental medicine especially to Macrobiotic Diet (Brown rice and vegetable diet) set up by the late Dr. Yukikazu Sakuragawa and applied it to clinical practice. He has being using “Balance-alpha” for a medical treatment at the beginning of the launching of the product having a curative influence from it. The alimentary therapy by Macrobiotic diet is a method to cure illness gradually and slowly. It has no immediate effect in the short term, but patients suffering from cancer need the immediate effects on the treatment. “Balance-alpha” has quick acting antioxidative potency and is suitable to use together with the diet for medical treatment. “I started to use Balance-alpha since March, 2000 for adjunctive treatment having very good results on many patients up till now. Chemical drugs has the effect of reducing the targeted symptom but oxidizes the body at the same time reducing immunity and function of organs , mind and emotion. As a result it builds a body likely to develop cancer. Much the same is true of Oriental herb medicine.